BOCA RATON, Fla. — Check your jewelry. Are you missing something? A Boca Raton mom is hoping to find the person who lost a pendant in a parking lot. The silver pendant with an incredibly personal message was found right in the parking lot near the beach at Red Reef Park. Park rangers told Scripps station WPTV in West Palm Beach that items get lost and found all the time so it's important to pay it forward. “It caught my attention. I was curious," said Colleen Paul-Huss. She's working to reunite the pendant with its long lost owner. "I'm super glad that I found it," she told WPTV on Tuesday. She and her kids found a silver pendant -- about the size of a quarter -- around 7 p.m. on Sunday after spending the day at the Red Reef Park beach. "We were parked right here, on the south side of the park, and the necklace was laying right here facedown," said Paul-Huss. She said it appears the owner was fumbling around the car and may have dropped it on accident while unloading or loading up from the beach. "You can tell it's recent. It's not tarnished or anything," said Paul-Huss. She usually wouldn’t give it a second thought but it’s what the pendant said that got her attention. 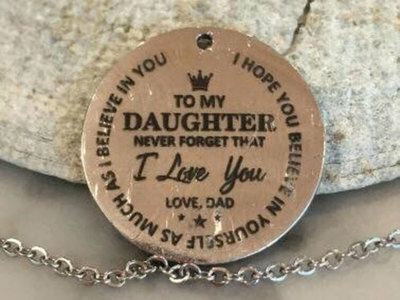 “It reads, 'To my daughter: Never forget that I love you. Love, Dad. I hope you believe in yourself as much as I believe in you,'" said Paul-Huss. “If my father gave this to me, I would cherish this. And I would be upset if I lost it." She knew she had to do something. “So we can find the person it belongs to," she said. So she posted pictures all over social media, hoping to find the daughter looking for her missing pendant. “To me, seeing something shiny on the ground from a father to his daughter is something we shouldn't ignore and pay attention to," said Paul Huss. If you know who the necklace belongs to, please email Colleen Paul-Huss at colleenph@me.com .